The prevalence of anemia in pregancy in Indonesia is 40.1 % by National Family Health Survey 2001. Data from Health Office Pekanbaru City showed prevalence of anemia in pregnancy in Tenayan Raya Public Health Center is 54 %. 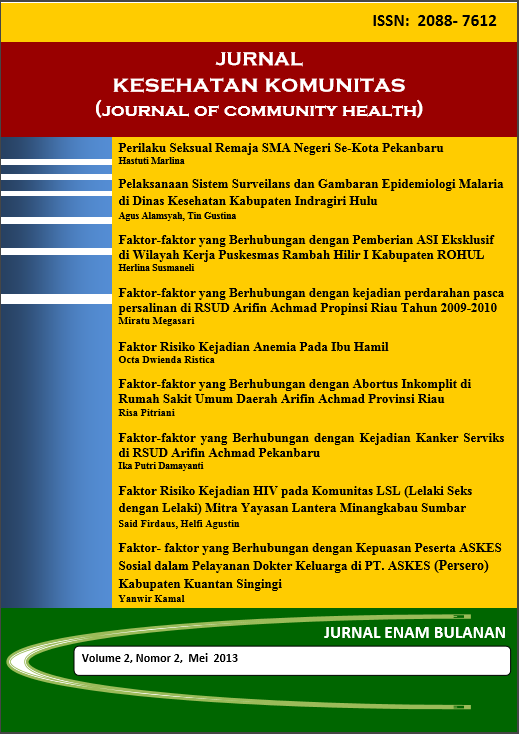 This cross sectional study was designed to identify risk factors with anemia in pregnancy in Tenayan Raya Public Health Center. Two hundreds and twelve pregnant women were included in this study . Data obtained usinh questionnaire and analyzed using regression logistic test. This study showed Parity (CI95%: OR = 1.66 to 6.16), adequacy of iron intake (CI95%: OR = 1.59 to 5.80), Status KEK (CI95%: OR = 1.44 to 2.50), maternal education (CI95%: OR = 1.24 to 4.50) were significantly associated with incidence of anemia in pregnancy. Unrelated variables are maternal age, family income, employment and knowledge. multivariate analysis showed the parity (number of children), the adequacy of iron intake, KEK status, and maternal education have a causal relationship with the incidence of anemia. Variables that are not associated significantly with the incidence of anemia in pregnant women is the mother's age, family income, occupation and knowledge. Suggest for pregnant women to plan their pregnancy, consume iron tablets as many as 30 eggs / month for 3 consecutive months and maintain the nutritional needs during pregnancy. For further research needs to study with different respondents, a different place and time by using continuous data.